Our All-Butter Fruit Cakes with Brandy extract make a perfect end to a traditional festive dinner or make an elegant gift idea for your family, friends and corporate clients. Many people tend to think of fruit cakes as a treat to be served at Christmas only but we are pleased to say that they make great gifts all year round. Our experienced and highly efficient distribution capabilities allow us to welcome orders as personal as one cake up to orders of over a thousand cakes to be sent to individual addresses across Canada and the USA. 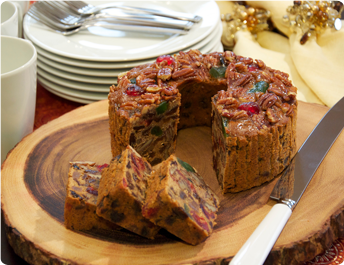 Please allow us the honour of having our Fruit Cakes served at your table during the holiday season and throughout the year.